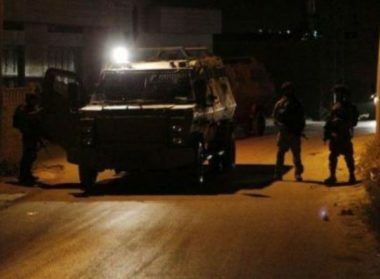 Israeli soldiers invaded, on Wednesday at dawn, several communities in the northern West Bank governorates of Nablus and Tulkarem, searched dozens of homes and abducted two Palestinians. Media sources in Nablus, said several army jeeps invaded Burqa village, northwest of the city, searched many homes and abducted Saif Qassem Hamdan, 25, in addition to briefly detaining his brother. The sources added that the soldiers also invaded Kafr Qalil village, and violently searched the homes of Yasser Amer, Tamer Amer, Tha’er Walid Ahmad and Suleiman Mansour. Furthermore, the soldiers invaded Zeita town, north of the northern West Bank city of Tulkarem, searched homes and abducted Laith Mohammad Abu Hamda, 25. In related news, the soldiers continued the extensive and violent searches of homes in Shweika area, north of Tulkarem, stormed into dozens of stores, homes and buildings, and interrogated many Palestinians. In addition, the soldiers invaded the homes of Na’el Kamel Zyoud and Ajaj Abu al-Kheir, in Sielet al-Harithiya, west of Jenin, in northern West Bank, and installed a sudden roadblock at Haifa road, before stopping and searching dozens of cars, and interrogated many Palestinians while inspecting their ID cards.